It's a String ThingChallenge: Here's a Sweet Valentine Needle Case You can Win! 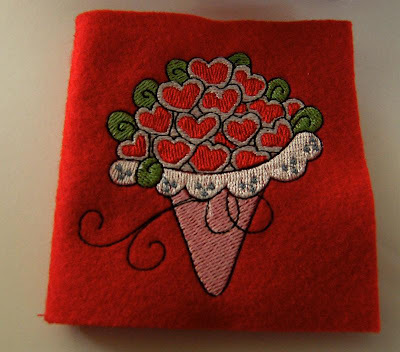 Here's a Sweet Valentine Needle Case You can Win! Hi Ladies, remember I said there would be lots of freebies and fun? Well, here is my first freebie and contest. 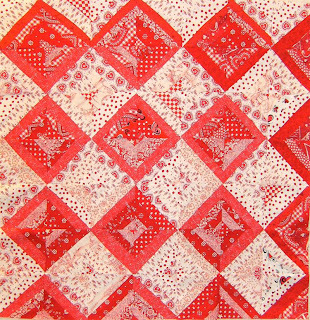 To add a little fun to our challenge, here is a quick Valentine-themed String quilt. I whipped up this little quilt in the last few days. I just used red and white strings. My blocks are a bit smaller then I usually make. They are finished at 4 inches. I am calling it "My Love Letters Quilt"
Now comes the fun part!! The first person to complete a red and white themed string quilt will get this valentine bouquet needle case. Machine embroidered by me!! Your quilt needs to be entirely finished. That means quilted and bound. You've got 30 days to get it done. The first person to finish, gets the prize!! Please post your pictures if you are a participate and of course email me with any questions. If you don't have a blog, I can post your pictures for you provided that I don't get bombarded with new participants. 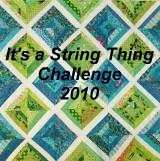 (I wish) Please tell your quilting friends about our challenge. New participants are always welcome. I would love to reach 100 participants!! Very cute Stacey. Love the challenge! Love the Red & White!! So romantic! And such a cute needle case! Hmmm....looks to me like I'd better sort my strings by color. Right now they're in tubs in no particular order or size.